Imagine this. It's St. Patrick's Day. You've stocked up on green apparel. You've got a shirt with a funny quip on it. You've picked out a goofy green hat to wear. You even got a pair of wacky green sunglasses. Nobody is going to try pinching you this year! There's just one simple problem. Are you just going to wear some kind of ordinary belt with that outfit? Of course not! You want to wear something that solidifies your style as the best that St. Patty's Day has ever seen. You need some Shamrock Suspenders, so you can ShamROCK the party! These St. Patrick's Day Suspenders will turn your look into the ultimate St. Patty's Day experience. The straps have a shamrock design and they feature adjustable clips that attach to most pairs of pants. They're an easy addition to any great outfit for the holiday and they provide instant pinch immunity. 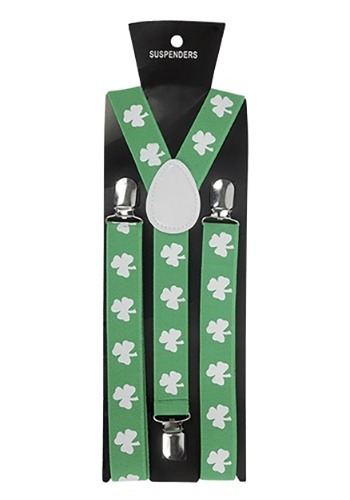 If you're trying to create the perfect St. Patrick's Day look, then you'll want to start with these Shamrock suspenders. If you just want to add a little green to your life, then these suspenders are also a great choice for you!